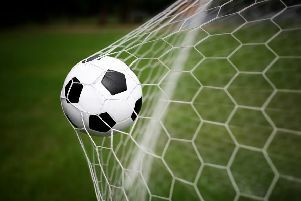 Little Common Football Club has made a dream start to its first ever season in the Southern Combination League Premier Division. Last season’s Division One champions have won their opening two matches at the next level up, scoring six goals and conceding none. Common player-manager Russell Eldridge said: “We couldn’t have asked for a better start. The boys are happy, I’m happy and hopefully we can continue in that vein moving forward. Common won 2-0 away to Shoreham - who were playing two levels above them last season - on Saturday before seeing off landlords Eastbourne United AFC 4-0 at The Oval on Tuesday night. “The boys have been magnificent,” continued Eldridge, speaking after the latter fixture. “They’ve taken on board all the information we’ve given them and the quality is there to be seen at times on a difficult surface tonight and at the weekend. Harry Saville in possession against Eastbourne United AFC. “The boys have stepped up to the level that we wanted them to and long may it continue, but there’s plenty of hard work ahead and it’s just the start of a long journey. Common did the damage against Eastbourne with three goals during the first half before sealing the victory with one more during the second period. “I thought we did the work in the first half,” Eldridge went on. “There was a spell in the first half where we passed the ball really well and the first goal was excellent in terms of the movement. “We also got a little bit sloppy in possession of the ball in the middle third of the first half and then we turned it on again towards the end.